What do you do when something just won’t come together the way you think it should? I’ve just had a stitching false start. The piece I thought I knew what I was doing with, didn’t agree. We couldn’t come to terms, it was deeply frustrating. And although I like the old Robert the Bruce adage of ‘if at first you don’t succeed…’, I do not have the same mettle as fugitive medieval kings or patient cave dwelling spiders. No, I failed, and so I did what was the most satisfying thing I could think of at the time – I ripped it out of the frame. 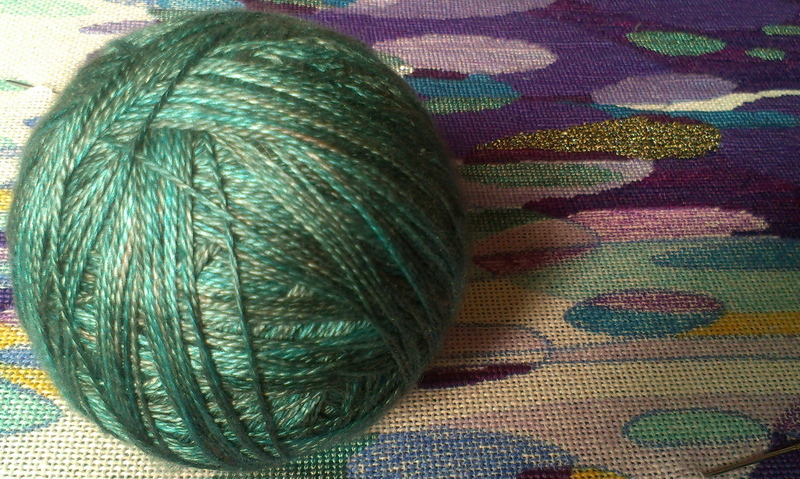 Instead, I am now working on a new piece inspired by a gorgeous silk yarn from Eleanor at Solstice Yarns – Moonbeams on a Mystic Sea. I am in love with this silk and I’m back in the flow – phew! I think everyone has false starts! My problem is that I cannot seem to throw mine away so I have a few half-baked projects from 20 years ago folded up and stored with my supplies. I just can’t throw them out but just know they are not worth finishing. … Your new project looks lovely and I also am in love with silk yarn. It’s difficult to let go of something once the process of creating it has started, isn’t it. I’ve got an enormous amount of poetry that just didn’t work at the time, and doesn’t come together on revisiting. Sometimes I can look at a piece of work a lot later, and see what to do with it and how to make it right. And sometimes not! False starts are maddening – I think it’s a horrible feeling when all that directed energy turns into frustration! Good thing to turn to something else. It’s a tantalising glimpse but it’s going to be beautiful. It probably sounds daft considering how slow this type of thing is to make, but I’m not really a very patient sort of person, when that ‘it’s not right’ feeling sets in it is deeply annoying, you’re right. I’ll try to put up some pics of the whole new piece, but the light has been difficult for a day or two and the subtlety of the colours makes it a bit hard to capture.